When it comes to VR, you really only have two choices today: a big, expensive headset that needs to be connected to a PC, or a less immersive setup that relies on your smartphone. However, Facebook is looking to give us a third option with the $200 Oculus Go. The new standalone Oculus is scheduled to be released in “early 2018" and looks to split the difference between the more expensive (and newly discounted) $400 Oculus Rift and $100 smartphone-powered headsets like Samsung’s Gear VR or Google’s Daydream. The Go will sport an all new fast-switch LCD display with a 2560 x 1440 resolution that head of Oculus Hugo Barra says should help eliminate the screen door effect (the lines you see between pixels) and help reduce lag or latency between when you move and when images change on the headset’s display. The Go will also include integrated spatial audio to help give VR experiences a sense of depth with speakers that are built right into the headset. But if you want to use your own headphones, there will be a 3.5mm audio jack, too. Barra also made a point to mention that the Go features a new lightweight fabric and facial interface that should make the headset more breathable and hopefully less sweaty than other VR headsets. App comparability for the new Oculus Go includes everything available in the Samsung Gear VR library, but critically, there was no mention if the Go will be able to play full Oculus Rift apps. That divide could be a big issue, because if the goal of the Go is to deliver high quality VR to everyone, the current selection of Gear VR content simply isn’t enough. Additionally, we’re still waiting to hear more on what components are powering the the Go, which will determine what kind of graphics and performance the Go can deliver. The new, “permanent” $400 price for the original Oculus Rift now includes two Touch controllers, all the necessary wires and sensors, six free apps including Robo Recall, and the Medium and Quill creative VR tools. And for those who already have a Rift, Oculus also announced Rift Core 2.0, which is a full redesign of the headset’s VR interface. The main component of Rift Core 2.0 is the new Dash UI which combines all of the Rift’s different apps and menus into a single hub that can manipulated using Oculus’ Touch controllers. The other part of Rift Core 2.0 is Home, which is a new Metaverse-like virtual world that you can build and customize to be your own VR domicile. 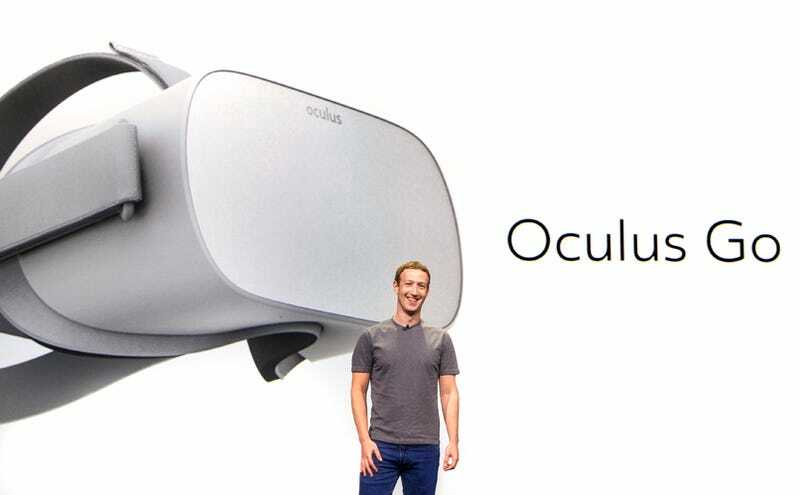 Finally, in addition to the new Oculus Go, Facebook CEO Mark Zuckerberg also (again) teased an unreleased prototype VR headset codenamed Santa Cruz, which promises new positionally tracked controllers with up to six-degrees of motion.